The most popular Military and ground support headset. Most popular noise attenuating headset ever produced for use with military radios. Standard headset of the U.S. Air Force, NATO and most airborne command centers. AWAC's, under command of NATO and the United States, use the H10-76 both in the cockpit and the communication operations. Headset of choice of M.A.T.S. pilots. Also used in ground support operations. Pros: Reliability and ease of use. Ready right out the box. Review: This product completely met my expectations. Pros: Great Quality, Parts Available, Good Price. Review: If you're looking for a basic headset for relatively short missions and want a reasonable price, this is it! Great for US Mil Helicopters - You knew it already! Review: I know I'm rehacking things that have already been said, but this headset works great in US Mil helicopters. I haven't tried it in a fixed wing aircraft with the adaptor, so that one is up to you to figure out. Shipping time was minimal as well, so that was a plus! Review: I have used this headset in multiple helicopter types over the last few years without any problems. The headset is comfortable and reliable. Highly recommended. Review: Great headset I love it, its amazing that they charge $502 if its ordered through government supply chains. I guess it goes to show companies all want a piece of the tax pie. Pros: Light wieght, sound cancelling, good communication. Review: I use this product everyday. I am in the aviation end of the Navy. We share headsets, so they can take quite a beating. The only problem we encounter is the PTT cords that go from the headset to the radio are always getting broken. Cons: Louder Aircraft, Longer Missions -- you may want a higher-dollar headset. Q: Will these headsets work on commercial aircraft like airbus a330,a340 boeing737,747,757, etc.? A: For the Boeing, yes. But you will need to convert it from a single plug to the dual plug and you will need to switch from a dynamic microphone to an electret microphone. The whole change just takes about 2 minutes with our David Clark H10-76 Conversion Kit. For the Airbus it becomes more difficult. First, you would need to get the David Clark H10-76 Conversion Kit and then convert from the dual plugs to the 5-pin XLR found on the Airbus. Q: do you make a military to civillian helicopter conversion for this headset? A: Yes, we have a David Clark H10-76 Conversion Kit that will convert the H10-76 for use in a civilian fixed wing aircraft. Q: is the same david clark H10-76 head set with david clark under part number 12510G-21 ? A: Yes, this is David Clark part #12510G-21 model H10-76. Q: Which one is better in sound protection for use in civilian GA, H10-76 with conversion kit or H10-13.4 ? A: The David Clark H10-13.4 is definitely the way to go if you are flying a civilian aircraft. Q: Here is a doozy. I need to use one of these for some work in Afghanistan but when I get back to civilian life I am wondering if it is possible to convert it to work with regular 1/8 earphone plugs for computers/ipods, etc. A: No problem at all. If you just want to use it with computers/MP3 players, you would need the CD / MP3 Player Headset Adapter - Helicopters. If you want to use it in civilian fixed wing aircraft, you would need the David Clark H10-76 Conversion Kit. And, if you are converting to use in civilian aircraft and want to plug into a MP3 player, you would want the CD / MP3 Player Headset Adapter - Fixed Wing to use after getting the David Clark H10-76 Conversion Kit. Q: I have a military headset, how can you tell the difference between a h10-76 and an h10-76XL? I am looking for a conversion kit to use in civilian aircraft and noticed some can not be used on the XL, thanks! A: The difference between the two is that the XL is the ANR (Active Noise Reduction) model. You can use our David Clark H10-76 Conversion Kit with both the H10-76 and the H10-76XL. Q: I have H10-76, and need to convert it to civilians helicopters. Does exist a kit with an electret mic and single U-174 plug (high impedance for civilian choppers)? A: Absolutely! We carry an H10-76 Conversion Kit which contains an 1142-22 Electret Mic and a JB-08 Helicopter to Fixed Wing Adapter. Q: I have a H10-76 with a M-4 electret mic. Will I just need the adapter to convert from the single U-174/U plug to a two plug system (PJ-068 and PJ-055B) to be able to use this in civilian aircraft? A: To convert your H10-76 to use in civilian fixed wing aircraft, you will need the David Clark H10-76 Conversion Kit which includes both the plug adapter and a new microphone. Q: Is the conversion kit for the H10-76XL to GA easy to install (mic) or does it require a visit to the shop? A: It is very easy to install. You will just need a very small screwdriver (like found in an eyeglass repair kit). It's just two small screws and you're done. Q: Can I use this headset in a R22 Helicopter? 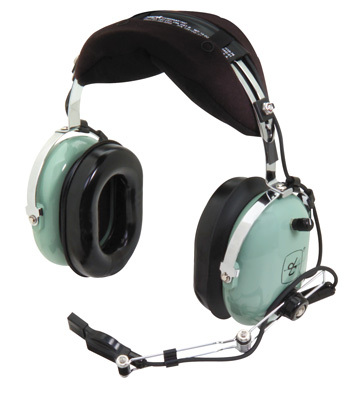 A: This is a military headset and should not be used purchased for use in civilian helicopters. You would instead want to choose one of the Helicopter Headsets found here. A: This headset can be used in civilian fixed wing aircraft, however the microphone would need to be switched and the cord itself must be converted. We do offer a Conversion Kit for this purpose. Q: I know these are not for civilian use, but what modifications would I need to do to make this specific headset work? I work for a military contracted company that absolutely needs this H10-76 headset to work for civilian use. Q: will this headsets work on normal airplanes like i piper warrior or other airplanes like those? A: No, this is a military headset. Q: RE: H10-76. I am looking for something to replace my lost 10-40s. The 10-76 seems most like what I had. Is it practical to have the modifications done (for civilian use)? A: There are no batteries needed for this military headset. It does have a single volume control. Please be aware that this headset will not work in a civilian aircraft without modifications.